Our five (or six, if you count psychic abilities) senses work together as well as independently in extraordinary ways. What we may fail to realize is how much we’re affected by our sense of smell in every moment of our lives. What we smell influences our moods, emotions, and even actions without us always being aware. This is why scent is an extremely powerful tool in altering your current state of being. If you want to change how you’re feeling, it can sometimes be as easy as changing what you’re smelling! Incense, candles, oils, and perfumes can inspire a variety of moods, depending on the scent you choose. From calmness to contentment to excitement, it can enhance and uplift the atmosphere. When you’re ready to relax, use these six scents in whichever form you prefer. If you’ve ever visited a Buddhist temple, you’ve likely inhaled sandalwood. Both an excellent scent for encouraging calm among worshippers and a lovely scent at home, sandalwood produces feelings of well-being and serenity. This scent comes in many varieties, so you can burn different types of sandalwood incense for a warmer or quieter sense of relaxation. If sandalwood provokes feelings of nostalgia, try a past life reading to learn when you may have smelled it before. Jasmine can make anyone happier just by inhaling a wild bouquet of these small white flowers. Jasmine also has calming properties and is believed to aid in easing depression. Though this scent contributes to relaxation, it also provides a low level of alertness, which prevents you from slipping into a feeling of complacency. As such, burning jasmine incense can help you feel uplifted. When you need to relieve stress, lavender is often the best choice. This gentle purple flower is known for its relaxing and calming effect on both the mind and body. Inhaling the scent of lavender can also help you sleep deeply for longer periods of time. Because it helps you achieve deep sleep, it’s also known as a method for alleviating insomnia. Since lavender is relatively powerful, be sure only to burn a single stick at a time. For a moment, imagine wandering through a quiet, shady evergreen forest. A slow stroll like this can melt away stress, and so can burning pine-infused incense. Pine scents can help reduce anxiety and combat feelings of depression, not to mention improve feelings of relaxation. Though pine is sometimes considered a wintery or even Christmastime scent, its properties can provide calming effects year-round. There’s never a bad time to burn pine incense. A small flower not unlike a daisy, chamomile is most often consumed as an herbal tea. Its incense is similarly herbal and can provide feelings similar to drinking a cup of nighttime tea. Like the tea, the scent of chamomile incense inspires contentment and warmth. If you’re having trouble feeling truly content, though, consider talking with a clairaudient to understand what’s really eating at you. Citrus scents often inspire alertness and higher energy, but lemongrass, which has fresh citrus fragrance, eases anxiety and alleviates stress. Breathing in lemongrass also uplifts you and makes you feel revitalized, which together helps you feel good about yourself. A scent with many powers, lemongrass can also inspire you to meditate and encourages you to feel emotionally balanced. 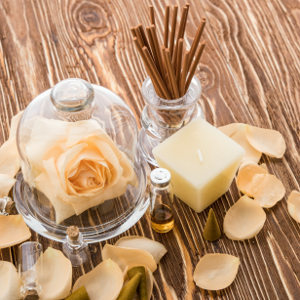 Whether you burn incense or use oils during meditation, when winding down after a long day, or when awaking each morning, be sure to use the right scent for your mood. The effects can be transformative!